Circular-saw blades are helpful woodworking tools, but they are also ideal for cutting other materials, like laminates. Laminated materials are more abrasive than wood and require circular-saw blades made specifically for cutting hard, composite materials. When preparing to cut laminated sheets with a circular saw, look for blades that can cut through laminate surfaces, absorb shock and create a smooth cut line. Most circular saw blades are 7-1/4-inch in diameter and are constructed of steel with carbide tips that can be resharpened. Whether you are cutting laminate or wood, it is important to consult your circular-saw manual to determine the right size of blade to use on your model. To cut laminated materials, look for circular saw blades manufactured specifically for cutting laminates. Circular-saw blades with a high Alternate Top Bevel (ATB) create smooth finishes on laminate materials. ATB circular-saw blades feature teeth that alternate between a left- and right-hand bevel. The alternating blade teeth create a cut that resembles a knife on each side of the blade. This results in a clean cut. 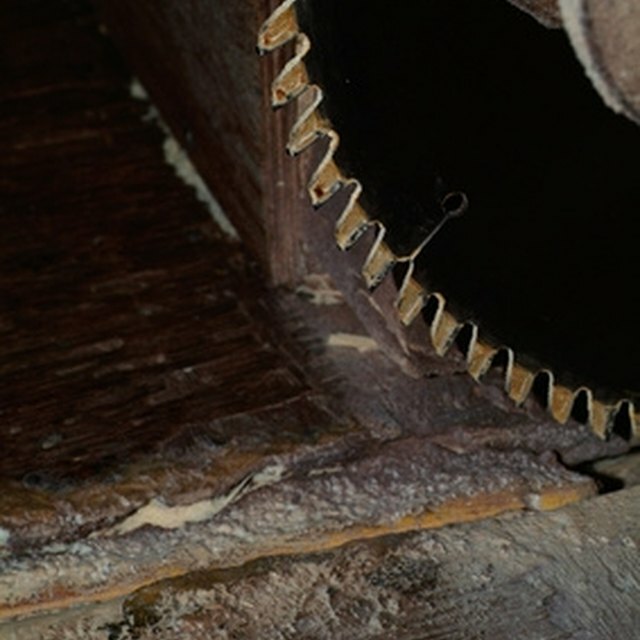 Laminated materials are prone to splintering and chipping, so the higher the ATB configuration of the circular saw-blades, the cleaner the cut will be. In addition to laminated sheets, the high-ATB circular-saw blades create smooth cuts on medium-density fiberboard, hardwood, veneered plywood, melamine and most composite materials. Triple Chip Grind (TCG) blades can be used on a variety of products, but they are primarily used for cutting aluminum, mediumdensity fiberboard, plastics, hardwoods, Corian countertops and laminate flooring. The TCG blade features shorter, flat-top teeth alternating with longer, trapeze-shaped teeth with angled corners. The TCG blade doesn't have sharp points like an ATB blade, so the blades often last longer when cutting through dense laminate material. The heavy-duty TCG blades absorb impact when cutting hard laminate sheets. The TCG saw blades can be combined with various hook-and-rake angles to create specialized cutting options. They should not be used on softer woods like hemlock or pine as the blades can easily tear the wood. Alternate Top Bevel with Raker blades are often referred to as planer blades. Like the ATB blades, the ATBR blades feature teeth that alternate between and left- and right-hand bevel. However, the ATBR blades typically combine four ATB teeth with one flat-top tooth that is called a raker. The raker tooth cleans out the cut as you use the circular saw. The ATBR blade is considered a multi-purpose blade and can cut plywood, medium-density fiberboard or laminate. Some ATBR blades are designed with a higher ATB teeth-to-raker ratio, such as 10 teeth for each raker. A seasoned public relations professional, Kristen McClung has more than 15 years of writing and editing experience. She has created publications for a wide range of clients, including real estate, business, engineering, education, religion and non-profit organizations, and has written and edited for Work.com and contributed articles to eHow. McClung has a bachelor's degree in journalism from Indiana University. What Is a Kerf Cut? Can I Use a Mandoline Slicer to Make Waffle Fries?